OMG I've fallen in love with pesto! Since I've started school I don't always have the chance to make my lunch so I order out. One of my favorites is a spinach pasta salad with pesto dressing.Yummy. I finally figured out how to make this incredible salad. Ingredients: spinach, tomatoes, pine nuts, feta cheese, spiral pasta, black olives, artichoke hearts, olive oil ,and pesto sauce. Cook pasta, and cool. In bowl place spinach, sliced tomatoes, crumbled feta cheese, cooked pasta, black olives artichoke hearts, and pine nuts. 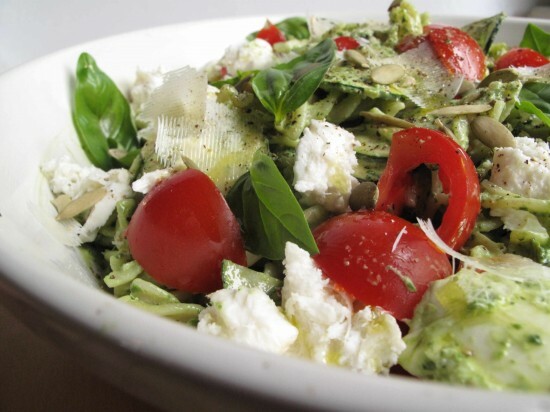 Mix olive oil and pesto together and toss into salad. That's it. It's so easy and totally yummy!